When playing multiplayer games, we all at some point come across options or paths for victory that are less than ideal. If it’s possible to adjust the rules or patch a game such that the option in question is better or more rewarding, then it might be better for the game. However, sometimes it’s not, and if one has to choose between making a move “too good” or “too bad,” the latter can be the better option for the sake of the overall health of competition. This is what I call the “ryanpeikou dilemma,” after a particular hand in Japanese mahjong. Ryanpeikou is the older brother of the “iipeikou,” a hand that consists of two identical straights. For example, 123 and 123 both in the same suit would qualify as iipeikou. It’s a fairly common hand in Japanese mahjong, and while it isn’t worth a lot of points the setup for iipeikou is often quite flexible, and so even if you don’t get it you can still be rewarded with something nice. Ryanpeikou, then, is essentially two “iipeikou”: 123 123 of the same suit with 456 456 of another suit is one example of a ryanpeikou. However, while the two hands are related, ryanpeikou is significantly more difficult to obtain, and in fact in my experience I think I can count on one hand how many times I’ve achieved ryanpeikou. Given the rarity of this hand, it’s understandably worth more (3 han instead of iipeikou’s 1 han), but for the trouble that it’s worth it really is relatively weak. Why go for a ryanpeikou when it’s possible to aim for hands that are easier to achieve and score more in the process? The issue is that ryanpeikou is a little too weak as a 3 han hand, but would be a little too strong for a 4 han hand. If it’s made too good, and it also has the similar late-game flexibility of iipeikou, then it overshadows many of the other hands around it. Because of the rules of Japanese mahjong, ryanpeikou cannot achieve a satisfying equilibrium of risk vs. reward. At the same time, it would be wrong to get rid of it entirely, because then you wouldn’t be rewarding the player at all. Buffing in and of itself is seemingly simple enough: all you have to do is make a character or a weapon or spell more powerful. However, the wrong buffs could have unforeseen repercussions, such as over-centralizing the game, and in some cases it might not be possible to deliver the proper buff due to the mechanics or rules of the game itself. So before you ask why a game can’t just make everything powerful, or that it is “always better to buff than to nerf,” keep in mind the ryanpeikou dilemma. Saki is special to me. While I certainly was no stranger to anime and manga when it first aired, Saki (along with Akagi) formed the foundation of my interest in Japanese mahjong. As I learned and improved at the game, my experience with Saki also changed, going from not understanding the nonsense going on to realizing how much Saki mahjong is nonsense (fun, but nonsense nonetheless). I’ve had a lot of fun throwing panels about mahjong and analyzing the amazing powers that crop up in Saki. I also know I’m not alone in this respect: Saki is known for changing the genre of mahjong manga from the exclusive domain of yakuza narratives and hard-boiled intensity to girlish yuri and high school competition. 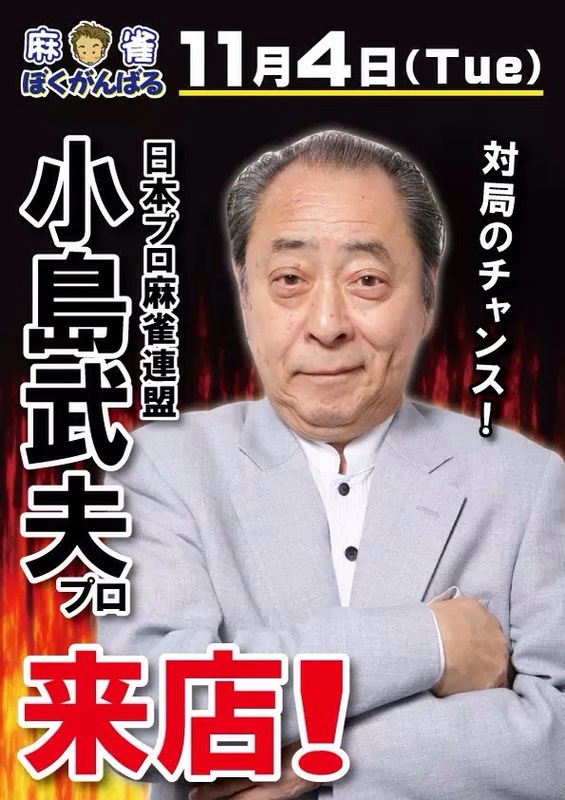 They even made a tongue-in-cheek parody manga about the author! With that in mind, I recently picked up the first two volumes of the English digital release of Saki by Yen Press. Had I realized the first volume was already out for two months I probably would’ve nabbed it sooner. Saki is the story of a young girl named Miyanaga Saki who, similar to Takumi’s role in Initial D, has an immense talent for mahjong but is not a fan of the game. She gets roped into her school’s mahjong club, where the class president notices her absurd strength at the game despite Saki’s best efforts to hide it. She eventually joins the mahjong club and starts their path towards the high school championships. Going over these early chapters (which I had really only seen in anime format), quite a few things strike me as noteworthy, all of which can be summed up by the fact that, at this starting point, Saki is still trying to find its way. To say that the series did not have any basis in the yuri genre this early would be a baldfaced lie. In fact, the first thing that happens in Saki is Saki remarking on the beauty of her eventual teammate and best friend, buxom digital mahjong warrior Haramura Nodoka. One thing that does fade into the distant background, however, is the sole male club member Kyoushirou, who seems to start the series as a kind of male audience stand-in but eventually becomes all but fused with the background. I think at this point the series was trying to decide whether it would be more of a harem or more of a girls-only world, and it’s come to lean clearly in the direction of the latter. Another aspect that’s changed significantly would be the artwork. As creator Kobayashi Ritz’ style has developed, the girls have gotten softer, their features more simplified yet pronounced, and I don’t even mean that only about Dragon Ball Z-esque chest size power creep that has occurred over the years. Some of the girls look very different here than they do in the current chapters of the manga, and both look quite different from the official anime character designs. I personally don’t have a preferred style for the characters. 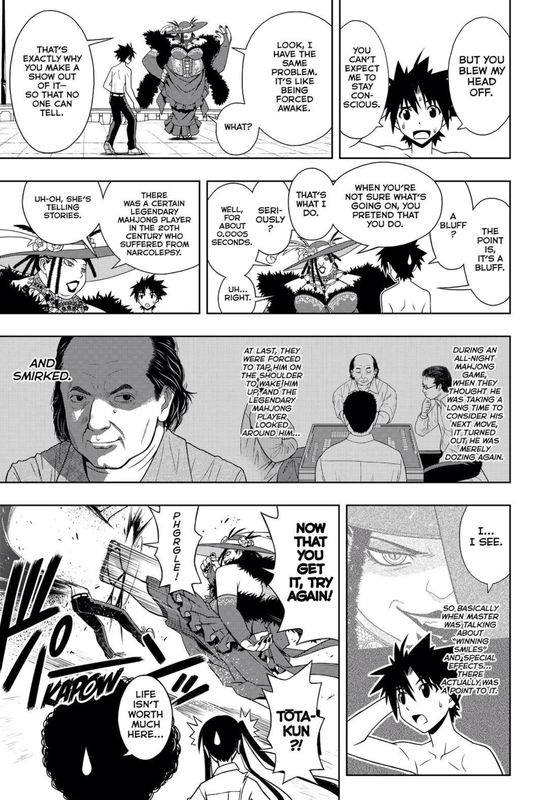 I also noticed that the manga actually sets up one of the major opponents for Saki and the rest of Kiyosumi very early on. As seen in the page above, one of the players is clearly Tsujigaito Satoha from Rinkai, which is a really strong school from later in the manga. There are no details about how Satoha basically dismantles opponents with pure skill as opposed to mahjong magic, but she’s there nevertheless. The last thing I want to say is, as someone who’s approaching Saki with a firm grasp of mahjong now, I can’t quite say how reliable the translation is for those who don’t have a clue. What’s notable is that it mixes official English terms from mahjong in general with a few Japanese-only terms, and I wonder if that helps or hurts, say, people who are only familiar with Chinese or even American-style mahjong. Does that matter at all? I certainly enjoyed the series in its anime incarnation despite a lack of knowledge, but do the still image flourishes of manga have the same impact as seeing the titles fall? Does the electricity of a riichi call work in panels as it does on screen? That’s something for a new generation of Saki readers to decide. The question of how much technical skill or physical prowess should play a factor in competitive games is an on-going debate that really puts at the forefront the tension between “games” and “sports.” I’ve discussed this divide previously in reference to Super Smash Bros. with the intent to understand both sides, but a recent comment by Starcraft and Hearthstone community leader Day has me thinking about the extent to which technical refinement can contribute to the competitive viability of a game outside of the environment of competition itself. While explaining why he believes that Counter Strike: Global Offensive is the best-designed competitive multiplayer game (emphasis on the word “design”), he organizes his argument into four key points that a lot of the best games tend to share: an engine that encourages interaction, room for strategy, variety of content, and some sort of execution skill with clear reward. In elaborating upon the idea of execution skill, Day explains that it can often be difficult for players to feel a sense of improvement if the goal or evidence of improvement is too abstract. In contrast to the difficulty of tracking your decision-making, getting a basketball into a hoop has a clear goal, and the actions you take towards achieving that goal are immediately noticeable (did this help me shoot more hoops successfully or not?). In my time playing Japanese mahjong, I’ve run into a number of hurdles that made it difficult to truly gauge whether or not I’d improved. As much as mahjong takes skill, it’s still a game where luck is a significant factor, and when playing opponents who are equal or better than you, it’s not uncommon to go on a serious losing streak that makes you question if your previous wins were due to luck of the draw or if you’ve indeed progressed as a player. It’s only over the course of many games, as well as by facing players of lesser skill, that it becomes more obvious if your skills have improved. You begin to see the mistakes that you made in the past in the actions of other players, and you understand on a more fundamental level what made those decisions mistakes in the first place. The big issue is that this is a painful way to go about improvement, and it would not surprise me if most people were not this masochistic about finding out whether or not they have become better players. One has to claw in the dark, finding bits and pieces of light wherever they might appear, and eventually find out if they’re now standing on something stable or a worn-out rope bridge. Abstract thinking and decision-making are difficult to quantify, which is why something like a Training Mode in a fighting game is so appealing to players. As Day mentions, even if you fall behind in terms of strategy, a game with a “high-variance execution skill band” can give players something to aim for (no Counter Strike pun intended) with very clear rights and wrongs. Compare trying to learn a high-damage combo to trying to understand intrinsically the concept of a “neutral game.” Some players are better at technical execution and others are better at grasping deep concepts, but I think both players would agree that the combo, the headshot, the waveshine are all much more tangible than what David Sirlin calls “yomi,” or reading the mind of the opponent. This can be a problem, as explained by James Chen when he refers to fighting game players who try to master the art of complex attack patterns (mixups) that cause the opponent’s defense to falter (“opening up the opponent”) without actually understanding the fundamental goal is that you’re trying to psychologically intimidate the opponent into not blocking. James makes an important statement, which is that, while many people believe that the “neutral” (the game state where both players are fully in control and have equal dominance on the field) is all about the mixup, in fact the mixup is the reward you get out of winning the neutral. After all, what use is your amazing mixup and combo game if you never actually get to land it? It’s complex, I know, and it’s amazing that James is able to explain it so well. Back to Day’s point, what I find to be the major significance of this idea of high execution skill is that improvement becomes almost like a salve, a way of reassuring yourself that you’re not that bad, or that you see a clear path towards getting better. Unlike blaming your teammates (common to DOTA 2 and League of Legends), this isn’t merely a placebo; you’ve still gotten better at your game on some level, and the best players marry brains with brawn. When looking at discussions of competitive games, certain communities such as Super Smash Bros. Melee and Starcraft will tout their games’ “high skill ceilings” with respect to technical skill as signs of their superiority as competitive games and as esports, but the presence of a high skill ceiling also becomes a comforting warm blanket. Even if you falter in terms of strategy and abstract thinking, you have the option to continually improve without needing it because you can advance your execution skill. When I say that this idea seems to bring competitive gaming away from the competitive environment itself, what I mean is that, even though the improvement of skills (be they mental or physical) are generally supposed to accompany you to the moment of competition (whether it’s a tournament or a ladder), the ability to look back at your progress and declare yourself better than you once were is just as important. “I am not what I was yesterday.” Unlike strategy where the personal rewards can be distant and obscure, execution skill is both a short and long-term confidence booster, bringing the competitive game to be just as much about constructing pride as it is about victory or defeat. “Mr. Mahjong” Kojima Takeo Appears im Akamatsu Ken’s UQ Holder! In a recent chapter of UQ Holder!, the main character Konoe Touta gets a lesson in how to mask one of his greatest weaknesses. To make a point, his teacher mentions a certain famous mahjong player who suffered from narcolepsy. That player is actually Kojima Takeo, the most well-known mahjong expert in Japan. Nicknamed “Mr. Mahjong,” Kojima has been active for decades and even still plays today. Last year, he attended the World Riichi Championship in France along with his fellow players from the Japan Professional Mahjong League. November 20 is the birthday of Ogiue Maniax, and while I’ve forgotten it before it was never quite to this extent. All I can say is, whoops! It’s not really that big a deal in the grand scheme of things, but an annual look back is one of the traditions of this blog, and it’s one I like to keep up. So, here we are. Of course the biggest change this year for me and the blog has been moving back to the United States. In light of this, I’ve considered maybe doing something new for it. Perhaps a new banner? Maybe a new series of posts? Then again, the Gattai Girls and Fujoshi Files are still going on, and especially with the former I can only get a new post out once every few months. I also tend to drop a lot of ideas after bringing them up for no other reason than lack of inertia. Switching back to the old daily posting schedule is also a possibility, but at this point it might not be so feasible like it was four years ago. At the same time, I’m still devoted to posting at least twice a week, though this has come with its own challenges. A few years back, in an effort to not fall behind when I was extremely busy, I started writing a number of posts in advance so I could keep up a consistent schedule. It’s worked, but one side effect is that often-times I’ll have ideas that I should be posting sooner when a show or whatever is fresh in people’s minds, but then I delay it because I have so many. What happens then, if I have a huge archive of drafts such that I don’t have to write anything for a while, is that I start to feel a bit disconnected from anime, manga, games, and even myself. It’s a weird feeling, like somehow I’m engaging less with this stuff (even though I’m still watching and reading plenty). However, if I start posting all of them at once, I get nervous about running out of a supply. I still have posts from like two years ago that I finished and just never published because the timing never seems right, and some I’ve gotten rid of because they just didn’t feel right. I don’t know if I’ll ever get rid of this feeling, even if this blog magically became my job and I could live off of its profits (fat chance). In fact, that might make me feel even more pressured which might result in Ogiue Maniax losing some of its identity. That’s not always a bad thing, but still something I probably wouldn’t do. I know it sounds like I’m not enjoying the blog anymore, but that’s not the case at all. It’s still my favorite place for talking about the things I love. To end off, I want to use this post to give a eulogy to my old Tenhou account. Though I managed to reach 4-dan a while back, my own neglect resulted in me failing to log in during the 3-month grace period, and so it’s been suspended with no way to bring it back. I now have to start again from the bottom, though of course that’s not actually the case, seeing as I’m re-starting with a lot more experience behind me.